Our allotment garden has had an exhausting season, pumping out a whole host of misshapen produce, from beetroot the size of a (small-ish) football, through to carrots so small they were barely discernible to the human eye. 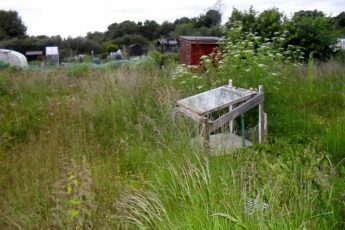 We managed to scrape through another year of minimal allotment upkeep without receiving a ‘tidy this mess or be gone’ eviction letter from the council, but our slack ways have resulted in a decidedly shabby plot in desperate need of some TLC. Now is the time to sort out the mess before winter takes hold. 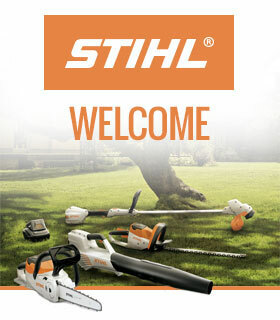 With battery-powered assistance from STIHL’s new Kombi engine – complete with Ghostbuster-style battery rucksack and a host of allotment-taming attachments – we’ll be working our way through a variety of tasks. 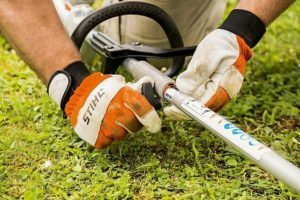 STIHL’s KombiSystem is a multi-tool set-up where you can pick and mix which tool attachments you need to keep your allotment or garden in check. 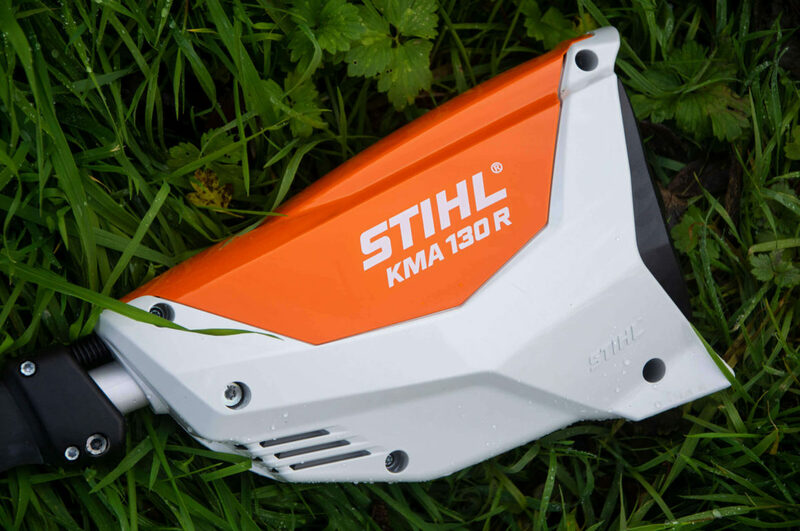 Previously, the Kombi engines driving the tools were all petrol-powered but STIHL introduced a new battery-powered version earlier this year, the KMA 130 R, which we have been testing and certainly makes the job a bit quieter! So it’s time to buckle-up and get things straight with the following five winter allotment garden tasks. Our Kombi tool has been residing in the shed, but we can’t get to it thanks to a mass of sad, crispy hop bines that dangle down over the door. 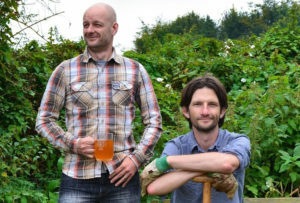 Most of the hop cones have been picked and made into beer (the beer long since guzzled) so our first job was to chop back the bines to ground level. The hop rhizomes (underground root systems) will lie dormant over winter and sprout back into life come spring with minimum input needed from us – just how we like it. Now the shed is free from its hoppy coat, we’ll give the wooden panels a lick of paint for extra winter protection, taking care to scrub away any mould or algae before application. The inside of our shed will receive a rigorous sweeping, and we’ll check for – and remove – any old seed packets that might attract the attention of rodents. To prevent other unwelcome guests, we’ll check over our security measures, making sure all locks and bolts are present and correct and nothing worth stealing is left inside. The sea of grass that surrounds the shed and flows between the veggie beds was long, straggly, and full of discarded bean sticks, stones and half-eaten apples (spat out by our resident deer, Derek). On top of this, we had a carpet of leaves, deposited by the trees that surround our plot. It was a right old mess and no mistake. With the aid of the blower attachment fixed on to the KMA 130 R Kombi engine, we gave the grass a good blasting to help herd the leaves into a nice pile. 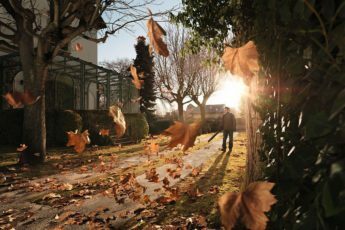 Take a look at our guide to Autumn leaves for tips on what to do with them. We then raked the grassy areas over and attached the brush cutter attachment with mowing head to give the grass its final haircut of the season. Our veggie beds are full of vegetal remnants and weeds. To put us in pole position for springtime planting, we needed to dig them over. 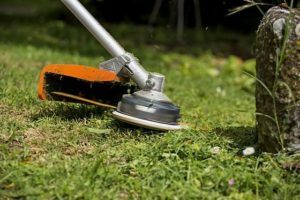 Turning the soil tends to spread weeds if you are not careful so it’s always best to remove any weedy perennials first. It’s Kombi tool time again, featuring the fearsomely toothy pick tine (our favourite, not least because it resembles a medieval torturing device)! We made a couple of passes to break the soil into a fine grain, ready to greet its veggie residents next spring. We then covered our freshly prepared beds with a weed suppressant mat to prevent new weeds re-emerging and spoiling our hard work. One sure fire way of convincing the plot inspectors that you are a diligent allotmentist is to keep the edges of your beds neat and tidy. We would normally enlist the help of a half-moon hand tool to re-cut the sides (combined with a plumb line stretched across the area in question to keep things straight) but to make things considerably easier, the KombiSystem can be fitted with an edge trimmer to do the job instead. The scruffiest of all our beds in the allotment is the one that houses our heritage rhubarb collection. Now that we’ve sorted the edges, we’ll remove any dead, slimey rhubarb leaves which have the potential to harbour slugs and snails. To keep rhubarb plants healthy and to keep their size in check, crowns should be divided every five or six years during their dormant period. Just take a sharp spade and divide the plant into three or four sections. Replant the divided sections, or pass them on to your allotment chums. 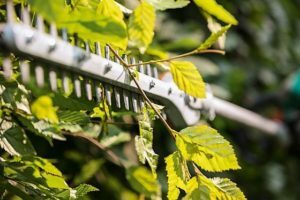 For our Kombi’s final task of getting our allotment ready for the winter, we attached the hedge trimmer to cut back the surrounding brambles that have been encroaching on our land from the adjoining field. To be honest, we’d normally tackle this task with nothing more than pair of sharp secateurs, but the Kombi gave us more reach, enabling us to chop back the bushes without having to hop over the barbed wire fence. Also – it’s great fun. Unruly hedge, eat my torque! What other allotment tasks are you taking on this month? 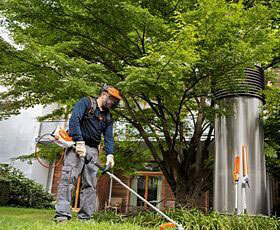 What jobs could you tick off the list with the help of a STIHL KombiSystem? Let us know in the comments!